This is part of a series of articles on games in the Netherlands – a link will be added here when the summary article is published at the end. 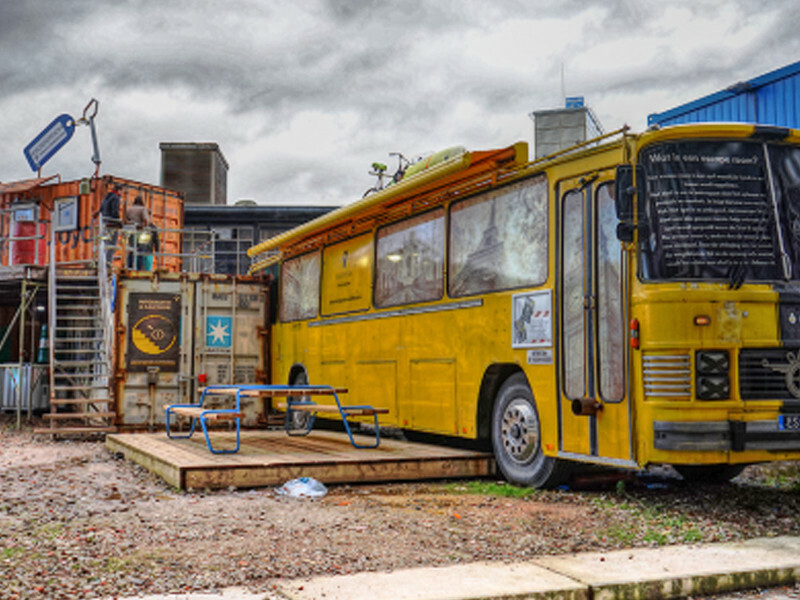 Escape Room Eindhoven has to be one of the more interesting venues, set as it is across a series of containers with a large camper van outside. As soon as we walked in, I had a feeling we’d be disappointed by the games. It gave a strong impression of making money first and creating great experiences second. Yes, every company has to make money, but here it felt like that might be the only goal. As it turned out, the games were actually quite interesting, although not always for good reasons. The best one was probably Disco Inferno, but the clue system ruined the experience – there’s a very strong core game, though. Adventure Cabin was pretty poor but, if you’re well travelled and like geography, you may find yourself having a surprising amount of fun. Crime Lab was just terrible. If I were them, I’d throw it away and start again. Notch another one up against the “here’s something I’ve never done before” list. A game aboard a mobile home was an interesting concept – plenty of built-in compartments to hide and lock clues, but surely relatively little sense of exploration? I’m assuming it was primarily made as a mobile escape room and just parked outside the venue when it’s not in use – the mobility presumably being a good trade-off for the fact that you know the dimensions of the game going in. It’s not the most welcoming of environments. It wasn’t pretty – looking more like a rundown trailer than a high-class camper van. It was poorly lit. And it smelled. Not a lot, but enough to make me feel like we’d made a mistake coming here. In spite of that, they surprised me with a thematic beginning – the clock starts to tick down when you turn the key in the ignition – a minor, but welcome, detail that played to the theme. And this game is, in some sense, all about the theme. Virtually every puzzle is in some way related to travelling. For some players that will be painful. For others it will be enjoyable. In fact, this game benefits massively from outside-the-room knowledge to the point where it may well be impossible to finish in the time available if you don’t have a decent knowledge of world geography and culture. Between us, though, we did, with several languages, plenty of different cultural experiences and a fair amount of travel, so what could have been a chore actually became quite fun. The game is split broadly in half, with the first half being heavily parallelised and the second, shorter, half having a couple of tracks to keep you occupied. During that opening sequence, there’s a pain point in the overuse of four-digit codes that results in having to try out the same code in several places. That was made especially painful for us when we found a couple of the puzzles to be ambiguous (or, more likely, easy to make minor mistakes on). That said, they weren’t entirely low-tech, with a couple of electronic keypads unexpectedly making an appearance. And that was pretty much the game – no story, not much theme apart from the puzzles, and then a series of puzzles that were, at best, OK.
Coming out of the camper van, I felt slightly guilty. In my heart, I knew it was a poor-quality game, but the truth of the matter is that, while I didn’t have an amazing time in it, the group we played with happened to fit the experience pretty well so, after we got used to where we were, we actually had a surprising amount of fun. If that’s your team too, then maybe it’s worth a visit. Probably not, though. Let’s start with something positive: this game had a fun start. Appreciate it because, after that point, I don’t think you’ll find a huge amount more to enjoy. It’s not just fun: it also gives a sense of isolation – you’re in a container, and there’s a real feeling that you can’t easily get out. That fitted the theme well and, when combined with the darkness, really helped to make it an unsettling environment. That’s an admirable goal, as long as it doesn’t adversely affect players’ enjoyment of the experience. And the feeling of isolation absolutely didn’t, but the darkness in the container did, especially since they only gave us one torch between the entire team. There’s a feeling throughout the game that you’re fighting for light with your teammates. Given that it looks like a fairly empty space, there’s a surprising amount of searching required to make progress, including one search that we failed on because we didn’t want to make life difficult for the resetter. My advice is to focus on finding everything and accept that the GM may hate you a little afterwards. Speaking of hate, for those of you who hate padlocks, there’s great news. They obviously got the message that people don’t like playing games with lots of four-digit padlocks in, so they replaced some of them with… lockout safes. Joy. Rather than having to go and try out your code on several four-digit padlocks, you now get to put incorrect codes into a lockout safe… Those padlock-haters must be so excited! Even better, one of the first puzzles you come across is ambiguous, and not just with two choices but with several. Oh, and you know how you think that number you found is meant to be used for a safe? Well, it’s actually the password for the computer. Yes – they’ve used a number for a computer password in a room with lockout safes. Five minutes into the room and I’ve pretty much lost all faith in the game. That’s all painting a very negative picture, but there were moments that showed they were trying hard – three puzzles used very physical mechanisms although, in two of those cases, they took the fun out of the challenge by either making it trivially easy or making the result not very exciting. The finale to the game was pretty much the death knell. A long, ambiguous puzzle with lots of maths where they’d been inconsistent with the way they’d applied the rules and which required painstaking reworking if you made any mistakes. Fortunately, they gave us a clue for the one place where we’d made a mistake. Escaping from this room was not an exciting event. It was a relief. Another container-based experience, Disco Inferno could have been one of my favourite games of the trip if it hadn’t been let down by the clue mechanism. Where other games have a walkie-talkie, here we were left on our own with an automated clue system. A clue system that NEVER gave us a useful clue and instead just told us what we already knew. GMs are important to games – they can read the players (and oh, would they have been able to read us!) and offer custom clues. Either of those would have massively changed how we felt about this game. First impressions in the room were good. It was by far the best decorated of the ones we played here and, while the soundtrack was disappointingly not disco, it was still fun music to play along to. I was excited at what I saw, and that doesn’t happen often. I lucked out and started working on a cool physical puzzle that was very different to anything I’d done before, involving a mixture of skill and luck in a way that was ultimately very rewarding. My teammates picked less successfully so, by the point I was free again, they were all pretty frustrated with the room. On another day, I think things might have gone better, which reinforces the importance of that GM decision – if they’d had access to even a little hint, I think each person would have solved their puzzle, but the build-up of frustration left them stuck. That wasn’t helped by the game giving the impression that lots of puzzles were on offer when in fact only a small subset could be accessed at any given time. We frequently tried to solve incomplete challenges, which ramped up our feelings of frustration. It’s a heavily structured game from a puzzle perspective, where you have to solve ten puzzle trails. These are put together so that you have full access to a fair number of them at any one time but not so many that you’ll be overwhelmed. Each trail varied in length – sometimes with just a single challenge, other times with three or four. There was certainly plenty of content, and I suspect most teams don’t finish without a lot of additional clues from the GMs. Yes, GMs. While I said that there was no GM for this game, that’s not quite true – they do come and check on you after half an hour, at which point they’ll point you in the right direction for several of the puzzles. I imagine that they hang around a little longer with struggling teams. At their heart, I think the puzzles here are good. Too many of them have small flaws, but most of them could be easily fixed with a little effort. The fact that they haven’t tells you a lot about the venue. That said, it’s a textbook ending to the game. Fun, frantic but with an ultimately simple puzzle to finish the experience that may initially confuse you but then leaves you confident of the right answer. If only the rest of the game had been such good quality. That’s all on Escape Room Eindhoven – want to read more about other local games? A link will be added here when the summary article is published at the end.